It's SHF time again, hosted this month by Ronald of lovesicily (wonderful travel site, by the way...). Our theme is coffee...this is not good! For Matt and I are most definitely not coffee people. We don't drink it, don't cook or bake with it (if we can help it), and I personally can't tolerate the smell of it. Basically, coffee makes me ill. But I hate to miss out on a food event, so I plugged my nose and prepared a Pâté Trompé;...for the in-laws! Lucky me; Matt's parents are big coffee lovers. My FIL roasts and grinds his own beans (well, not beans he's cultivated by hand, but some pretty fancy/pricey ones just the same). First, I must confess the above photo is not, in fact, the dessert I created. It is the photo of the dessert in the fabulous Cocolat, from which I attempted my own coffee gelée/coffee mousse confection. 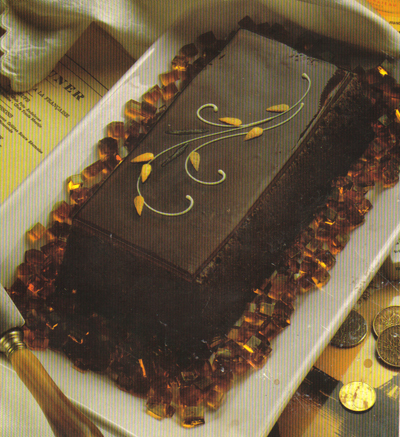 First, make a coffee gelée, pouring a small amount into a loaf pan, and the rest into a cake pan. Allow to set. 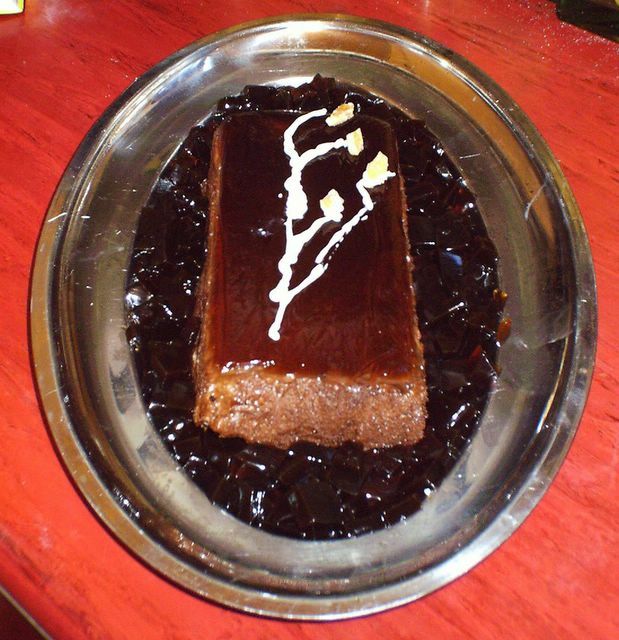 Make the chocolate-coffee mousse. Pour immediately into loaf pan and chill. To serve, unmold loaf pan onto a platter, scatter cubed coffee gelée around the mousse, and (if you feel up to it) decorate with white chocolate and candied citrus peel. I took the mousse to the in-law's house Wednesday night, and haven't yet had their review. But, it smelled like coffee, so I'm guessing they liked it! Here's my attempt...not as pretty, but it took mere days for the in-laws to finish it. Don't forget to send your Blog Party entries in before next Thursday (18 August)! That sounds so awesome. We really enjoy the Coffee/chocolate combo. I'm sure that, for those who enjoy coffee, this would be heaven in dessert form. Coffee and chocolate just goes so well together. I'm curious, how does one make coffee gelee? I made it using powdered agar, strong coffee, and a bit of sugar. It set beautifully. This sounds like a great recipe, Stephanie - impressive to those eating it yet simple for the one making it. Thanks for joining in on SHF - sorry for forcing you to make something with coffee! Hopefully next month will be more up your alley! Thankfully, it wasn't too difficult to make. And I was able to rather quickly unload it on my in-laws, so it worked out. One More Week for Blog Party Entries!